How often have you complained about having to use reading glasses or bifocals or whined about having to squint to see things in the distance? If you're ever looking for inspiration or if you want to get over feeling self-pity, there is no more appropriate area to look than the athletic world. This past month, a high school senior named Jay Spencer from St. John Paul II High School won the Alabama State wrestling championship, though his vision is limited to just a corner of his left eye. Jack Olson, completely blind since the age of 12, was a long snapper for his high school football team and walked on to the University of Southern California football team and successfully made the snap for an extra point against Western Michigan. Still complaining about not being able to find your glasses? Reid Fellner is a junior at Acalanes High School. His vision began to fail when he was in the second grade and was ultimately diagnosed with a condition called Stargardt's Disease. It is characterized by macular degeneration resulting in a progressive loss of vision. Whereas normal vision is 20/20, Fellner's vision is about 20/400. Fellner responds matter of factly to his condition: "My vision can be a problem but I try not to let it affect me. I use magnifiers to read and I am able to utilize the current technology which is improving all the time. I try to get through the best way." Fellner comes from an athletic family. His sister Kate played lacrosse at UC Davis and his other sister Lucy is on the swim team at UC Santa Barbara so it was natural for Reid to play sports as well. Reid, who is also on the swim team at Acalanes went out for the wrestling team as a freshman: "I wanted to try something new. I fell in love with the sport and have been wrestling since then. I love that it is both an individual and team sport. As it turned out, it was also the easiest sport for me with my visual limitations." There is one concession made to wrestlers that are limited visually. Both wrestlers must stay in contact with each other and if they separate, the match is stopped and then restarted. Cory Salmon has been a high school wrestling official since 1996 and has only refereed two matches in which one of the wrestlers was visually impaired and has had far more matches in which a deaf wrestler was involved. "We start the match with both wrestlers having contact with each other, palm to palm," explains Salmon. "There was never any issue with the other wrestlers. It's just a subtle difference for them in not being able to break away from each other. Besides that, there is no difference in how I refereed those matches." Acalanes head coach Micah Canestaro has been working with Fellner since his freshman year: "Reid has come a long way. When he began, he was more timid being new to wrestling and the physicality of it but he has always been a fighter and his heart has really stood out. He has become more offensive and physical. He never stops once the whistle blows to start the match until the end. The tenacity and the fight that he's learned is something that can translate to anything he does in life. It's beautiful to see that in a wrestler. He has unbelievable character and is very mentally tough and strong. He's just a good person to be around and everyone recognizes and appreciates that on campus. He's an inspiration to us as coaches and to the other kids as well." Fellner wrestles at 145 pounds and appreciates how he has grown with the sport: "I have improved and am more comfortable and aggressive when I wrestle. I have become more confident and quicker and have improved my reaction time. Wrestling has helped me with my overall conditioning, leadership skills, working with a team and my overall physical skills." Freshman Dashiell Fabela sees Fellner as someone to look up to: "Reid is a very positive person. He's very kind and thoughtful whenever he speaks. He is always trying to do better and I've never seen him be negative in any way." Fellner's father, John, admired the way he handled the decline in his vision and the wrestling environment: "Reid has always been positive. It was actually harder on us than it ever was for him. It's a unique sport and Reid's coaches, teammates and the wrestling community as a whole has shown Reid great respect. It's been a hard, huge learning curve. Reid loves being involved in everything. He just keeps going and trying." 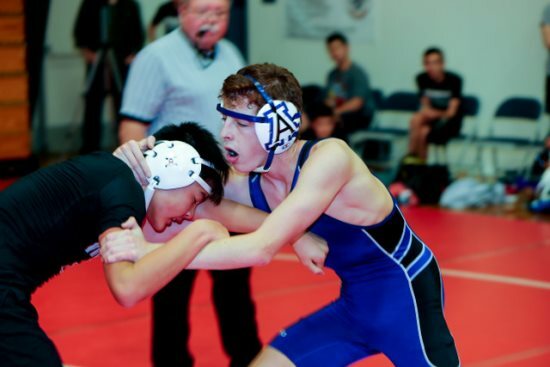 The character and drive Reid has demonstrated on the wrestling mat has also carried over to his classwork at Acalanes. "I enjoy history and math though my favorite class is in leadership," says Fellner. "My other senses have improved. It's hard to see details on people's faces but I am able to recognize other people's voices. The attitude that Fellner has brought to wrestling, he brings to his overall perspective of life: "I really enjoy meeting new people. I don't think about the difficulties with anything that I do. I'm constantly looking to improve."